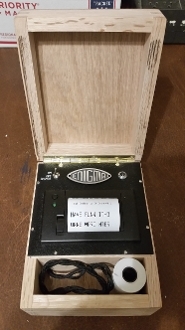 Resulting from suggestions from our community, here is our first Enigma accessory: a wireless thermal transfer printer that will print the encrypted or decrypted message so you don't have to copy down the lampfield lights. It comes with 6AA batteries and the Bluetooth receiver already paired with the Enigma. The wooden box includes a compartment to keep your extra roll of paper and stores the batteries for easy replacement.